In 2014, the Paul Nicholls-trained Caid Du Berlais became the only the second five-year-old to win the Paddy Power Gold Cup when overcoming Johns Spirit in the dying strides to win a thrilling renewal by a head. Baron Alco put up a thrilling front-running performance to land The November Meeting's feature race. The seven-year-old gelding's win was a credit to Sussex trainer Gary Moore, and also to his jockey son Jamie, who nailed the pace he was setting and had enough in reserve to hold off a sustained challenge from top-weight Frodon under Bryony Frost. The winning jockey, who took the ride on Baron Alco from his brother Josh after his original mount, Benatar, was withdrawn, said: "He's a very genuine horse, only tiny but he jumps from fence to fence. It is hard to make the running here, but watching the races yesterday and today it is clear that it suits front-runners. "He had a lot in his favour by making the running, and I notice that Frodon, who was up there with him all the way, finished second, so it was obviously the right place to be. I could hear Frodon coming at me on the run-in, and that is how we were beaten at Chepstow last time out - a horse came late there and beat me, whereas if the challenge comes earlier my horse will battle back again. "Dad is a master trainer - Traffic Fluide won a decent race for us recently over three miles and yet Dad will have winners on the Flat at Kempton and Lingfield all winter. He has winners at Royal Ascot. He gave this horse time off last year and got him back to run at Chepstow. "He ran well there, but it just shows how tough he is because horses can often 'bounce' after a run off a long break, yet this horse has gone and won this race. That's a credit to Dad and to Josh [Jamie's brother, and like him a jockey] who is a big part of this victory, too." Frost commented: "Frodon is a super horse. He has run his heart out for me again this afternoon. 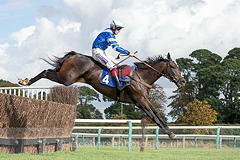 "He jumped and travelled really well and to run like that off a big-weight shows what a quality horse he is. "Frodon is a pleasure to ride and I'm pleased he's run another big race this afternoon. He is a young horse but very wise in between those ears. "Sometimes, they can't get in front but he has given me everything and you can be so proud of him. He is young horse but very wise between the ears in the way that he jumps and travels. "It's a massive honour for the owners to have the loyalty and for Paul to have the confidence to keep me on him. It honestly means the world to go out there and gallop a horse like him. "He is braver than me. When you have a horse that wants to win as much as he does, it's what racehorses are there for." Ditcheat handler Nicholls said: "Frodon has run a really good race. Baron Alco got a run on him, but he was closing all the way to the line. "He had to carry a lot of weight, but it is another great run. We'll step him up in grade now. "The Peterborough Chase could be something for him. We'll make a plan and he will want a month off as he had a hard race today." Nicky Richards saddled 12/1 chance Guitar Pete to finish a further eight lengths behind in third. "Guitar Pete's run very well", said Cumbrian-based Richards. "It was an eventful race but we're very pleased with him." Jack Channon, assistant trainer to his father Mick, was pleased with the run of Mister Whitaker, the 6/1 favourite, who finished a further three-quarters of a length back in fourth. He commented: "Mister Whitaker ran a great race. I think he would prefer softer ground, but it was a belting run in such a tough and competitive handicap event." First staged in 1960, the Grade Three BetVictor Gold Cup is one of Jump racing’s most illustrious and valuable handicap chases and its history contains the names of some of the sport’s finest horses. The two and a half mile showpiece, first run under its present title in 2016, was known as the Paddy Power Gold Cup from 2003 to 2015, and the Thomas Pink Gold Cup from 2000 to 2002. Whitbread, under the Mackeson brand and then Murphys, backed the first 40 runnings from 1960.